Build a Garden Archway You can make a garden trellis from just $25 of steel rebar. And you won’t have to weld a thing. Screen House Plans Build the perfect backyard retreat with plans and detailed how-to photos for a Craftsman-Style outdoor room. How to Build a Pergola Build a classic pergola in your backyard to shade your patio or deck using wood beams and lattice set on precast columns. Latticework Porch Trellis A trellis is an elegant way to get a degree of privacy for a porch, deck or patio. 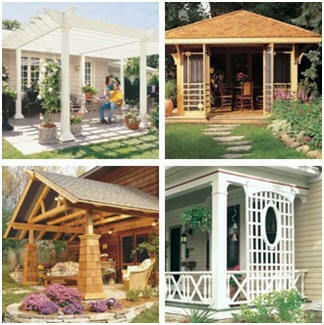 This trellis plan offers a unique design that allows you to adapt it to fit a variety of sites. How to Build an Outdoor Living Room Turn your patio or deck into a comfortable, protected outdoor room. This DIY-friendly design features exposed, natural wood beams and massive-looking (but easy to build) wooden piers. How to Build an Arbor with Built-in Benches Build this simple seating/planter/arbor project to create a quiet, private space in your yard or on a deck. It provides shade and comfort as well as a welcome screen from neighbors. 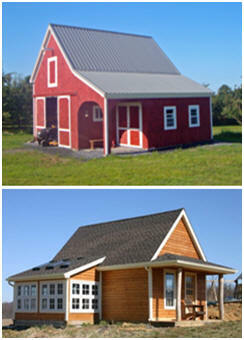 You can install it on an existing patio or build it on your deck. How to Build a Patio Privacy Screen This airy screen provides the perfect solution to a less-than-private patio or deck by screening in your outdoor living area. The screen offers an attractive look and unique design, which will enhance your yard, yet it's also DIY friendly to build. 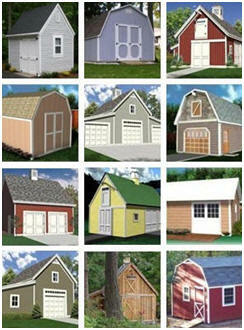 Visit www.TheFamilyHandyman.com for even more backyard project plans.